tourpack and backrest. The valves were redone for unleaded fuel and the original carb is rebuilt because the motorcycle sat unused for years. The 1983 Harley Electra Glide for sale has only 18,000 original miles and it even has the original oil-bath enclosed chain and newer HD tires. My father bought the used Harley for sale in Wisconsin in 1986 and rode it twice to Sturgis. This motorcycle was passed on to me 10 years ago and it has seen very little use. and please consider that this motorcycle is currently fitted with a short windscreen (but I still have the original) and that the crash bar, wind deflectors and other parts are included in the sale. Pros: The 1983 FLHT for Sale is in very good to excellent condition with few cosmetic issues and a very strong shovelhead motor that takes it rapidly to 80mph. Cons: The Electra Glide has a slight valve chatter which the local HD mechanic says is a common problem with shovelhead engines. The gear foot shifter does not automatically return to center after shifting which may have been caused by removing the rear lever and it's not a big problem but more like just something to get used to. If you're interested you may leave your offer, questions and contact information in the space below provided by GoGoCycles Used Motorcycles for Sale and I'll get back with you as soon as possible. GoGoCycles would also encourage bikers to submit a review of the 1983 FLHT for Sale to help potential buyers make informed decisions and to benefit the biker community as a whole. 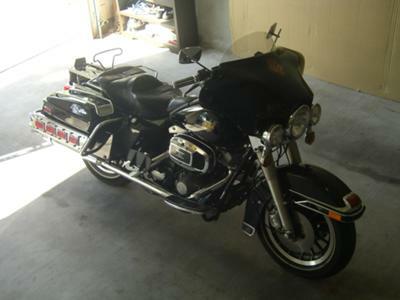 The 1983 Harley Electra Glide for sale is in Texas (near San Antonio). I will assist with shipping but the buyer assumes all shipping costs and my very cheap asking price is only $8,500! We have a spot for this in our Vegas Museum. Willing to pay $550 monthly and will cover all shipping costs. I know this was once owned by Willie G. I will contact you at the number you proved to us. Many thanks, Garp T.
The bike has been sold to a collector who almost passed out when he saw the condition. I guess I should have asked thousands more. 24 Oct: Well, a few of you think this bike is worth a lot more that I am asking. However, no one has shown me the money! I have seen bikes like this go for thousands more. What's the story? Attempted to start the bike after 1.5 yrs. Engine would only run with starting fluid for a few seconds. Removed the carb and found bad gaskets and some gunk. I will take carb to a local shop for total rebuild. Bike should be ready to go in a couple weeks. Email me if interested typing your questions and/or offers in the comments form beneath the ad. I thought the price of these bikes was like $25,000? Yes, it's true. Selling because I lost interest. Bike is a classic rubber mounted shovelhead that is very fast for it's age. Willing to consider all offers. Many extra parts to be thrown in. From Tom (seller). Bike is now at $11,000 OBO. YES, the bike is still available. Included is the near mint tour pack with liner, chrome top rail and wrap around pad, crash bar, original windshield, headlight, non-chromed engine cases, covers, and numerous original bolts, I even have the original HD blue saddle bag liners , tool kit, and owner’s manual. I will entertain all offers, I need the room. Thanks for looking! Just add the @ and the . symbol and voila! I am leaving it out because bots scan for emails and then I would receive their bounty. I prefer bounty of my choice. This is a great site! Best layout of individual classified ads ever! Robert: How about listing a correct email?